Short on time? 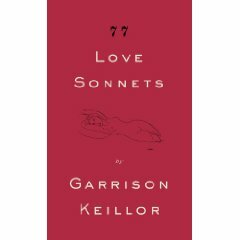 With just a few minutes you can sneak a little literature into your day with the fourteen-line poems offered by Garrison Keillor in 77 Love Sonnets. The topics range wider than the title suggests. And the writings seem to be written off the cuff, not heavily edited, expressing Keillor’s momentary thoughts and takes on places and events. In “Obama” he conveys his experience as one of the crowd on inauguration day. In “October” he revels in the security and joys that fiscal security allow. Among these pages you will discover sonnets that explore each of The Four Loves: affection, friendship, eros, and charity. In “Long Career,” Keillor states that “The secret of a long career is simply to not fade….” This prolific author appears to be taking his own advice by publishing this collection the same year as novels Life Among The Lutherans, Pilgrims: A Wobegon Romance, and A Christmas Blizzard.